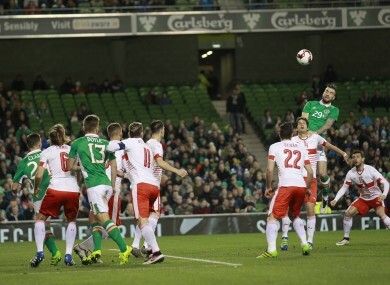 Ireland's Shane Duffy, right, wins the ball against Switzerland's Timm Klose during their international soccer friendly at the Aviva stadium last Friday. ON FRIDAY NIGHT against Switzerland, Ireland simply couldn’t keep the ball. The Boys in Green had just 31% possession, which is bordering on embarrassing for a home team. If Ireland looked a different side against Slovakia, it’s because they literally were. Martin O’Neill made 10 changes to the team that started on Friday, with only Shane Long keeping his place. Following the Swiss game, Martin O’Neill had criticised the team’s lack of confidence on the ball, but last night, they produced a much-improved performance, earning 58% possession over the course of the 90 minutes. The difference can’t be solely attributed to Wes Hoolahan’s presence in the starting XI — the Slovaks didn’t press as intensively as the Swiss — but the Norwich star certainly was vital in the team’s improvement. Hoolahan constantly looks for the ball, and his availability seems to inject confidence into the entire team, lifting his colleagues in a manner few other players are capable of doing. Ireland therefore had much more fluidity to their play last night, and the former Shels star was invariably at the heart of the Boys in Green’s best attacking moves, as he earned a deserved man-of-the-match award for his efforts. RTÉ pundit Didi Hamann was particularly impressed, explaining that there were few players, even in the Premier League, who possessed Hoolahan’s “gift,” also comparing his role in the team to the job that David Silva does at Man City. So on current form, it seems certain that the 33-year-old attacking midfielder will be in the starting XI for the Sweden game. Shane Long started just two of Ireland’s Euro 2016 qualifiers in total, but the Southampton striker emphasised his worth once again last night. Long won two penalties in quick succession, and his pace and power seemed to frighten the life out of Martin Skrtel and co in the Slovak backline. The 29-year-old departed the action at half-time after picking up a slight knock, and Ireland clearly lacked cutting edge in the final third following his premature departure. Yet even with all Ireland’s strikers fit, none seem capable of offering what Long brings to the table — Daryl Murphy might be stronger and Robbie Keane is clearly a better goalscorer, but in terms of overall attributes and value to the team, neither can compete with the Tipperary native. Of all the fringe players given a chance this week, none capitalised on their opportunity more so than Shane Duffy. The Blackburn centre-back was commanding and decisive against Switzerland, and the Derry native was one of the main reasons why Ireland kept a clean sheet on Friday despite being outplayed for large sections of the encounter. Alongside Ciaran Clark, Duffy was magnificent throughout the Swiss game, even earning a man-of-the-match award following this stellar display. The problem, however, is that of the four centre-backs likely to travel to the Euros, three individuals — Clark, John O’Shea and Richard Keogh — seem more or less guaranteed a place on the plane barring injury. Marc Wilson, who featured in a couple of qualifiers, also seems in a strong position to feature, despite a dismal season, owing to both a loss of form and injuries. And while Duffy’s displays for Blackburn have been consistently excellent, Wilson’s ability to cover both left-back (a problem position for Ireland) and centre-half might just give him the edge in their personal selection dual. However, on Friday, Duffy certainly proved that he was capable of playing at this level, and if one of the aforementioned names is unavailable, he will surely be the first in line to come in as a replacement. It was a disappointing night for Paul McShane against Slovakia, as the Reading captain was partially at fault for both the goals Ireland conceded. McShane committed himself unnecessarily for the opening score, allowing Slovakia space in behind to exploit as a result. Meanwhile, for the second goal, McShane diverted the ball into his own net. There were claims of a handball by Róbert Vittek in the build up, but either way, the Wicklow native found himself poorly positioned as he attempted to alleviate the danger. Of course, before last night, McShane’s chances of making the Euros squad already seemed quite slim — and that display may have ended all hope of the 30-year-old travelling on the plane to France. Aiden McGeady has at least shown some initiative in recent times. After being frozen out of the first team at Everton, McGeady joined Sheffield Wednesday on loan in January. The move came following warnings from Martin O’Neill that out-of-favour players would have little chance of making his squads, as Darron Gibson — another Toffees outcast — is currently discovering. Yet despite seeing more game time in the Championship of late, in the matches against both Switzerland and Slovakia (he started the former and came off the bench in the latter), McGeady lacked the level of sharpness and wit that he has often demonstrated at his best. There was one lovely vintage McGeady moment last night though, when a beautiful turn completely outfoxed his marker, prompting one of the biggest crowd cheers of the evening. Nonetheless, more often than not, the winger looked all too lethargic and lacking what Giovanni Trapattoni used to describe as “enthusiasmus”. Consequently, if he doesn’t up his game significantly at club level between now and the end of the season, the man who started Ireland’s Euro 2016 dream in Georgia is in danger of missing out on its realisation. In a way, perhaps it’s harsh to single out Quinn from Friday’s performance, given that others were just as culpable for conceding possession sloppily. Yet as the main creative player in Ireland’s midfield in that game, there was surely slightly more of an onus on him to bring the type of composure and class on the ball that Hoolahan tends to consistently deliver. In the end though, the game seemed to pass both himself and one-time Hull teammate David Meyler by, as Ireland were outnumbered and outclassed in the centre of the park. Having been in O’Neill’s first-ever Ireland starting XI in a competitive fixture against Georgia not so long ago, the Reading star seems to have slipped considerably down the pecking order and is another whose place at the Euros looks under serious threat currently. The fact that neither himself nor Meyler were given a chance to redeem themselves against Slovakia last night similarly does not bode well for their immediate international futures. Email “3 winners and 3 losers from Ireland's latest gameweek”. Feedback on “3 winners and 3 losers from Ireland's latest gameweek”.